Manatees are marine mammals in the order Sirenia. Manatees live in warm water and can be found along the coasts of Florida, Belize, Peru, Ecuador, Columbia, the Caribbean Islands, and West Africa. There are three species of manatees, including the West Indian (Trichechus manatus), West African, and Amazon manatee (Trichechus inunguis). The West Indian manatee has also been broken down into two subspecies, the Florida manatee and the Antillean manatee. The West Indian manatee is the largest, weighing about 1500 kg (3300 lb) and measuring 4 m (13 ft) in length. The Amazonian manatee is the smallest weighing 500 kg (1100 lb) and measuring about 3 m (9.8 ft) in length. These animals are descended from elephant ancestors and still have gray, wrinkly skin with single hairs sprouting up all over the body. 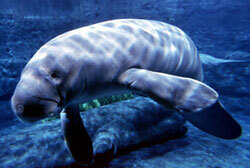 They are also called “sea cow” in parts of the Caribbean. Manatees have a rounded, paddle-like tail and a prominent muzzle covered with colorless bristles. These gentle giants only feed on vegetation. They use their paddle-like front flippers and highly maneuverable lips to bring plants into their mouths.Manatees are rather soft spoken animals. Their vocalizations are not very loud, with a mean estimated source level of 112 underwater dB, and are hard to hear even if you are listening intently. Manatees make chirplike sounds that are short tones with higher frequency harmonics. Amazonian manatees have been shown to have individually distinct vocalizations. Their calls mainly range in frequency from 2.5 to 5 kHz, although their entire vocal range is between 0.6 and 16 kHz. Most vocalizations are heard between mothers and calves, but manatee calls are also heard between adults while socializing and traveling. The vocalizations of manatees and their reactions to anthropogenic sounds have been studied using tags (See How do you measure a marine animal’s reaction to sound?). Scientists are also trying to use the vocalizations of manatees to warn boaters that animals are in the area. Fatal collisions with boats have contributed to the dwindling numbers of this endangered species.